The Sabunyuma Group is 4 men who live in SANKE, Mali. They are borrowing $2,175. Kassim is 39 years old with 5 children and is illiterate. He purchases calves, fattens them, and sells them in the market. He will use his portion of the loan to purchase an ox to feed and sell. We loaned $50. Lamberto is a 30 year old married man who lives in Oe-Cusse, Timor Leste. He started a business selling fuel a few years ago and has done well because he has a good location alongside the road. He is borrowing $400 to purchase more fuel so that he does not run out and not be able to serve his customers. We loaned $100. The Unidos Do Juscelino Group is 4 four young people (3 women and 1 man) who live in Sao Paulo, Brazil. They are borrowing $1,650. Ana owns her own beauty shop and will be using her portion of the loan to purchase disposable materials, sterilization and hygiene products, eyebrow tweezers, and cotton. We loaned $50. The Mujeres del Padre Winkel Group is a large group of 18 ladies who live in Encarnacion, Paraguay. Hermelinda sells ice cream. She is successful because the weather is very hot, and her ice cream is very popular. She will use her portion of the loan to buy additional flavors of ice cream in order to meet the demands of her customers. We loaned $100. Knarik is a trained agronomist who lives with her husband and two sons in Dvin Village, Armenia. On her farm, they keep chickens and raise cabbages, tomatoes, peppers, and strawberries. She then sells the produce in the local market. She is borrowing $2,000 in order to buy additional land and increase her production of vegetables and fruits. We loaned $100. 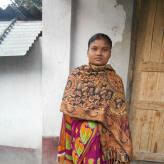 Tumpa is a 23 year old married woman with two children who lives in North Dinajpur, India. She and her husband purchase paddy grain directly from the fields, clean it, and pack it in sacks to sell in the market. Together, they make about $100 per month. She is borrowing $300 in order to purchase more grain, sacks, rope, etc. in order to expand the business. We loaned $100. Magneta is married with three children and lives in Migori, Kenya, where she operates a used shoe business. She has a good location, and most of her customers are local. She is borrowing $300 in order to purchase more used shoes. We loaned $50. Marta Paula is 58 years old and lives in LaFlecha, Honduras, with her common-law husband and a grandchild. She operates a pineapple plantation near her home and sells the pineapples to retailers in the area. She is borrowing 20,000 lempiras ($825) to purchase fertilizer and manure to increase production and improve the land. We loaned $100. Hoan is 59 years old, married with two children, and lives in Yen Dinh, Thanh Hoa, VietNam. She has operated a food stall/ restaurant selling rice noodles for 10 years and is borrowing $1,075 to purchase materials to maintain her restaurant. This is her seventh loan. We loaned $100. The Boda Boda Jinja Group is three young people who live in Jinja, Uganda. They are borrowing $375. Fazima operates a small restaurant. She will use her portion of the loan to purchase a small refrigerator to enable her to expand her menu by selling soft drinks. We loaned $100. Karam is a 51 year old woman who lives with her husband in Muzaffargahr, Pakistan, in a brick house with electricity, drinking water, and plumbing. Her embroidery business is very famous in the area. She faces a high demand for wedding dresses and is borrowing $525 in order to purchase thread, fancy cloth, sequins, and pearls. We loaned $100. Jasica is 23 years old, single, and lives with her parents in their rented apartment in Berj Hammoud, Lebanon. She has been working as a makeup artist in her home for six years and is known for providing a unique product at a competitive price. She has also worked in a beauty salon for the last four years to earn additional money. She is borrowing $1,025 to purchase additional cosmetics, lipsticks, wax bottles, mousse, and pins. We loaned $75. Gerlie is 36 years old, married with a 15 year old child. They live in Concepcion, Iloilo, Italy. She and her husband have been fishers for many years. She is borrowing $250 to purchase a new engine for her boat. We loaned $75. Thanks to each of you for supporting our activities this year. We had a very successful year and will be producing our Annual Report in the month or two.